This very unique commemorative bat was created to honor the first ever World Series Championship recorded by the Houston Astros. 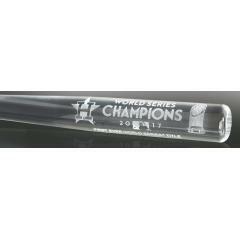 This special, full-size acrylic bat is laser etched to commemorate the 2017 World Series Champion Houston Astros. A one-of-a-kind collectible that Astros fans will enjoy putting on display in their home or office. This is a limited release so order yours today. Due to the limited availability of this item we must charge your credit card for the full price immediately upon taking your order. This policy ensures we reserve a bat for you. We will confirm your order by Email. This bat is not game used and may shatter like glass if dropped.